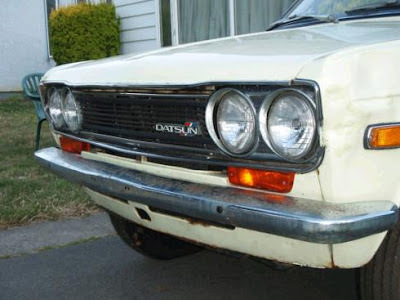 In its day, Nissan wanted you to believe that the 510 was as good as a BMW 1602. It wasn't, of course. But it was still a pretty good car. In fact, it was a very good car when compared to most other Japanese sedans of the day. The suspension is BMW influenced. There are struts up front and semi-trailing arms in the rear. Where this car really loses in comparison to the BMW is in its body styling. 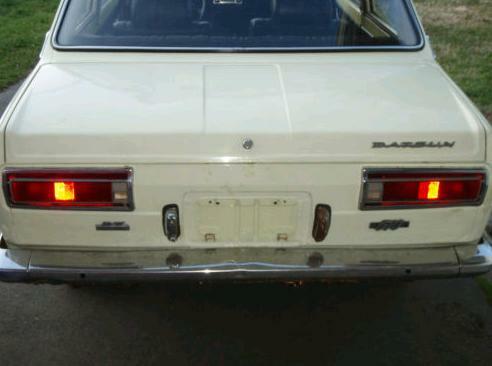 Nissan claimed it was European influenced. That may be so, but when you put it next to a 1602, it pales in comparison. This car is a claimed 31,000 mile car. According to the seller, it was purchased in 1989 from the 78 year old original owner and has been in dry storage ever since. Everything about this car is original, except the tires, which were replaced in 1988. 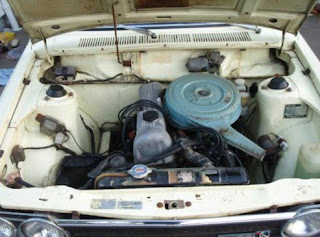 The engine has not been started since 1994. The seller mentions that fuel stabilizer was added back then, but that was 17 years ago. If I were buying the car I'd clean out the gas tank, fuel lines and carb on general principle. Given a choice between this car and a BMW 1602, I'd take the BMW. But, if you're a Japanese car fan, or looking for a low-mileage, fun to drive classic, this car might be a very good choice. Located in British Columbia, Canada, click here to see the eBay listing. I always wanted one of these. But why are the good survivors always automatics? Looking at the action this car is getting in the auction it makes me regret selling the hopped-up 72 Dime I owned about 5 years ago. That car, a 2 dr, lowered, alloys, a tach, twin SU 2.0 engine, etc. was a blast to drive and I sold it for a mere $3200. These cars are really fun to drive and easy to work on, but don't expect italian or german car engineering and detail. The metal is very thin, feels like the car is made out of tin, but boy does it go with the right engine.